Your kitchen is a perfect place to cook some delicious cuisines. Well, it is a comforting place, where you can make and eat some yummy food and relax your mind! While planning to make a dish, if you happen to suffer from blocked kitchen sink, then the cooking experience is likely to turn into a nightmare. You need emergency help to get rid of clogged kitchen sink, as you need to use it from time to time. Along with the grease from your kitchen, the soot, dirt and oil from the food leftovers, the oil and cooked items and vegetable skins that are thrown into the skinks, the kitchen sink spout can get clogged anytime, due to domestic callousness. Which are the best tools for Cleaning Kitchen Sinks? 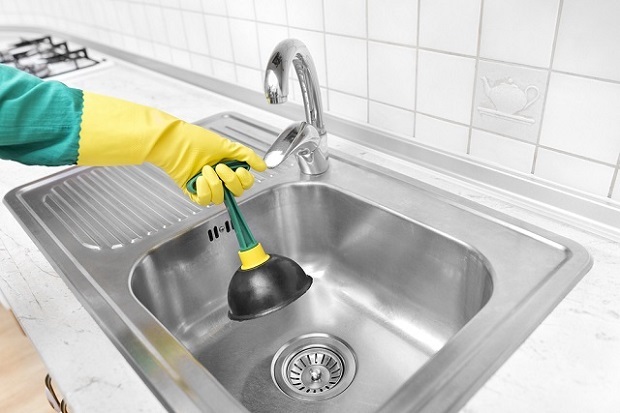 Before you start with blocked kitchen sink cleaning service, you need to look for the right tools. Without proficient tools, it will be hard to follow the steps. Let’s get into details of tools, which you need for cleaning the clogged mess. Snake or hand auger is the primary tool, used in this regard. It ranges from cheap to even expensive options, solely depending on the length, size and turning mechanism. It is always advisable to use 3/8 inches model for all round use. This model is mainly 20 feet long, and can be procured from home centers and hardware stores. This snake is quite easy to turn down into the drain. There are some shorter ones available too, used for clearing clogged drains. You need to keep plastic bucket or bucket handy to work with the snake. For maintaining the hygienic condition, you can wear hand gloves and good flashlight for help. Just like the snake, the plunger is another important tool, used for cleaning blocked kitchen sink. It is more like a long wooden pipe, with a suction cap on top. You have to place the suction cap facing downwards and sticking it in the drain mouth. After this, you have to exert proper pressure to absorb and release the dirt from the drain, but if you apply excess pressure, the entire pipeline can break, so you must take precautions regarding the use of the plungers, snakes or other drain-cleaning tools and mechanisms. Other than using a snake and a plunger, there are some quick homemade remedies which help you to clean blocked kitchen sink, as well. You just have to mix vinegar and soda for some magical effects. Before you use this mixture, protect your hands with rubber gloves. After that, use a cup or bowl to get rid of standing water first. Later, put 1 cup of baking soda and force it inside the sink with a spatula. After that, pour 1 cup of vinegar into that same drain opening. Later you need to wait for 5 minutes and allow this solution to work. After this, you can simply add one cup of boiling water to unclog the sink. Sometimes, harsh chemical mixtures are available online and from retail outlets. You need to pour this powered solution inside drains and wait for few hours. This is an acidic mixture, which will help in melting the dirt and dust, present inside the clogged drains. You should not use water at that time, or else; the effect of this powder will ward off. On the other hand, when you work for cleaning the kitchen sink, and then protect your face with a cotton cloth, while using these chemicals for clearing blocked kitchen sink. You might face some foul smell at first, but with time, this smell will ward off. This is an effective way to clear blocked sink.